In the pelting rain the pasture turned pigsty -- a vast expanse of boot sucking mud and oozing offal. With only 40,000 tickets sold and 500,000 people present the concession stand ran out of cokes about the time the Porto-Sans overflowed. These outhouses sat on a small ridge at the edge of the crowd their doors hanging partially open with streams of toilet paper escaping to the outdoors fluttering in the breeze like wind socks at an airport and giving warning every time the wind shifted carrying the acrid smell of excrement through the crowd, causing even the most steadfast stoner to swoon. Occasionally an observer would call out with a groan just before the stench washed over us. The concession stand must have been staked into the ground at the outset. Two cheery kids danced along to its movements trying to keep up with the crowd in front of them. It had become unmoored in all that rain and I remember finding myself walking sideways to keep abreast of the cash register while a thick crunch of ambitious customers teetered back and forth in an attempt to stay with the stand and get the last of the Coca-Cola. On my way back through the crowd with my small tray of Cokes I received a round of applause for my efforts. It seemed that even the smallest local event, local meaning within earshot, could trigger applause from one’s neighbors. After the first day, I never saw the concession stand again. Out of merchandise and unattended it must have drifted off in the sea of mud. On the second day a group of about 1,000 people lined up to try to use the bathroom at a small local bar that was accustomed to the hunting crowd as its clientele. My stepfather, an Eastern European disenfranchised aristocrat who saw himself as the great white hunter was quick to recognize my description of the place. The toilets were labeled “Pointers” and “Setters” and I had two dizzy girls ask me “Which one is ours?” The owner came to the front door and looked out at the gathering mass of hopeful faces; none he knew would spend a dime in his establishment. He yelled out “No men will be allowed to use the restrooms here--go piss in the woods.” From then on the matter of the “Pointers” and the “Setters” was moot but even with two bathrooms the wait was very long. On the first day, things were a bit unorganized and it was actually possible to walk up to the stage and ask to have a friend paged. I remember making my way up there and asking them to page my cousin. I knew she was out there somewhere in that crowd and a few minutes later her name rang out on the PA system and 10 minutes later we were standing together up front. What I didn’t know was that it wasn’t necessary to page anyone. Even among 500,000 people and license plates in the fields from as far away as Alaska, I seemed to run into everyone I knew who had come. 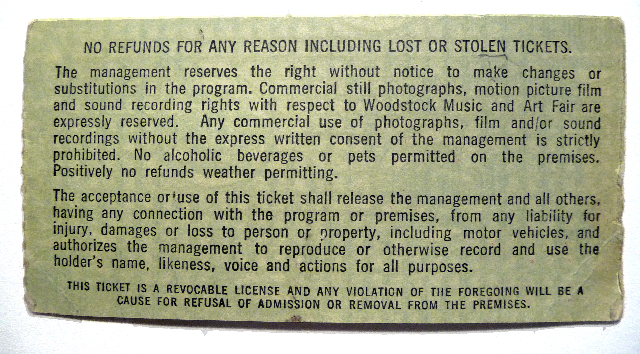 “Wow, you went to Woodstock.” I’ve often had that reaction from younger people if I choose to admit I was there. It creates awe but also gives away my age. I don’t remember everyone I saw play. The music went on 24 hours a day and I barely slept, I was wet and cold and covered with mud and I made the mistake of going with someone I didn’t like that much because I had a fight with my best friend John two days before and I needed a ride. I do remember waiting endlessly for Sly and the Family Stone to get on the stage. They had a lot of electronic equipment and refused to come on until the rain let up. I remember that poor Tim Hardin was the only artist capable of stimulating ire in the most good natured crowd I’ve ever been in. He was booed off the stage. Hardin was a serious drug user and he was nodding out in the middle of his performance. Word went out in the crowd that the needle was still stuck in his arm onstage -- a rumor I had no way to verify then or now. The night before it began we had shut down Route 17. We--a bunch of kids. The highway was so crowded with cars that the State Police, incapable of any solution to the largest and longest traffic jam ever seen on a New York roadway shut the thruway down and began diverting traffic. It might have been described as the largest tailgate party ever seen but this was not a football kind of crowd. Perhaps it was more akin to a drive-in movie parking lot in which the projectionist failed to show. We got out on the roadway and wandered from car to car--music blaring from each and every one and said “hey man”, smoked pot, and handed along little sheets of paper covered in blotter acid. A cloud of smoke rose and mingled with the stars and car headlights illuminated dust particles that transmogrified into butterflies and flew off in the evening haze. By morning Yasgur’s farm was overrun. Occasionally there were gaps between performances as we waited for a new act to arrive. We all knew the highway had been shut down and it was the whirr of helicopter blades that signaled that a band was about to arrive or depart. It was during those pauses between performances that some poor fool had to stand up in front of the mike and keep the vaguely restless crowd amused. One of the more inspired moments came at night during a lull in the rain. The guy at the mike asked everyone to take out a match or a cigarette lighter. In that crowd anyone who didn’t smoke cigarettes smoked pot so I’d have to guess that all 500,000 people had matches. Everyone in the audience was to light their match at the count of three. And for a flicker of instant--it was daylight. Someone was run over by a tractor in a field of high grass, a baby was born, people were kind to other people, a lot of people were stoned, everyone was filled with a sense of euphoria. It’s hard to know why everyone knew to come. All over the country young people packed their cars, got on airplanes, hitchhiked. Before I set out I had no idea that the urgency I felt about going--I had to go--was being felt by tens of thousands of other kids in big cities and small towns all across the United States. There would never be anything like it again. We weren’t just the baby boom generation. There wouldn’t be a “counter culture” in the same sense again. It would be possible in the future to stand on the sidewalk at Columbus Circle in New York City next to a pimply-faced boy who couldn’t have be more than 16 years of age and see a “Young Republicans for Ronald Reagan” button on his chest. Up until that moment it hadn’t occurred to me that it was possible to be young and be a Republican. On my way home from upstate in a deli 100 miles from Woodstock I stopped to buy a pack of smokes. It was easy to spot a fellow traveler; his jeans were caked with mud to the mid-thigh just like my own. For a moment we recognized one another. We had shared something that created a sense of intimacy between us. We both smiled. One outcome of the unexpected half-a-million strong audience was that no one had the presence of mind to collect the 40,000 tickets that had been sold. 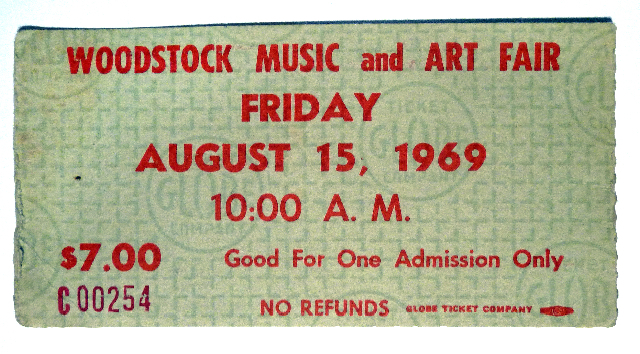 I was one of the 40,000 suckers who paid for Woodstock. I did take a brief look around to see where we were supposed to show our tickets but there was no evidence of a ticket booth. Perhaps, it was never set up or maybe it was trampled beyond recognition. I still had my ticket in my mud sodden blue jeans when I got home. Now it is forty, I am fifty-six and my daughter is exactly the same age I was when I set out with Dale in that gold Dodge Dart headed upstate.